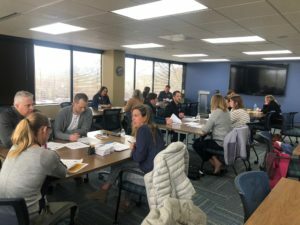 More than 30 manufacturing HR leaders attended the Alliance’s Manufacturing HR Excellence program on February 6 to learn about “10 Steps to Assess your Employment Branding Practices” from experts Andie Gebert, Michael Best Workplace Solutions, and Laura Fischer, Sikich LLP. The session gave attendees best practices for attracting talent and building a strong employer brand including a 10-point assessment tool that to evaluate the effectiveness of your hiring practices. Do you know who your top three, local “talent competitors” are? Are your job ads different than the internal job descriptions and do they actually speak to your target audience? Is your application available online AND able to be filled out, easily, from a mobile phone? Can you apply in under 5-7 minutes? How are you filling your talent pipeline on an ongoing basis by doing “preview” interviews with candidates? If you’re interested in learning more about the Manufacturing HR Excellence program, please contact Amanda Payne.